Though I’m reporting this FO in 2009, it was actually completed during the last week of 2008. And I think it’s quite a pleasant project to wrap up the year – a harbinger of the happy things to come! Project: Boteh Scarf by Kathy Merrick, appearing in the Spring 2007 issue of Interweave Crochet and available as an individual pattern in the Knitting Daily online store. Yarn: Eden Madil, 100% bamboo, color 629. Four skeins at 109 yards/50 grams each, used up nearly in their entirety. This yarn, or rather, working with this yarn (versus wearing this yarn), is my only complaint. There are no two ways about it – it is splitty. Eighteen slippery plies, all hell-bent on sabotaging this novice crocheter. While working, I had to be extremely careful in catching all the plies with every stitch. On a few occasions I had to rip back to correct misplaced plies, and it was irritating each and every time. Maryse (bless her and her crochet-pushing soul) warned me that the hdc edging would eat up a lot of yarn. And boy, did it ever! Thanks to her warning, I realized early on that I had left too little yarn to go around the entire scarf’s perimeter, and so had to frog only minimally. For the number-inclined, this 190-gram scarf has 31 grams’ worth of edging, the remainder (159 g) being the main triangles (of which there ended up being 16, just as the pattern recommends). Crochet hook and tension: US G-6/4.00 mm hook, 18 sts and 12 rows = 4″ in hdc before blocking. Finished size: after blocking, about 6½” wide and 78″ long. This is the size when the scarf is all neatly and flatly laid out on the floor. 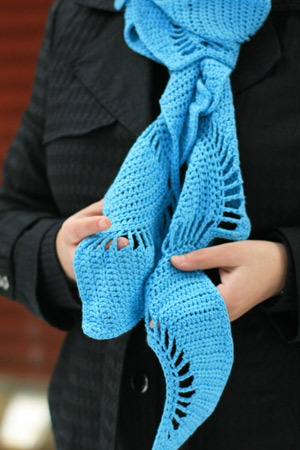 When worn, with a little help from gravity, the scarf twists on itself, narrows, and lengthens. A “long, skinny scarf” is what the kids call them, I think ;). 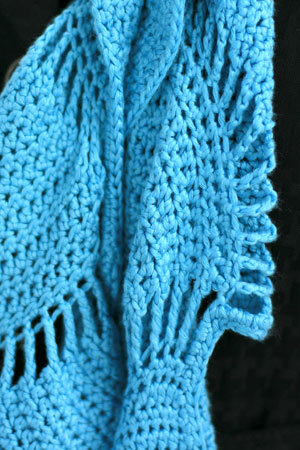 It will be absolutely perfect for the spring – so soft and so bright. What a fun-looking scarf that is. Nice work though, splitty yarn and all. The scarf is beautiful. I would never guess it was your first crochet project. It is an excellant piece of work. You had more patience with 100% bamboo yarn than I did. I bought a skein of truly gorgeous variegated blue bamboo yarn from Blue Moon Fiber Arts, and tried to knit a small shawl with it. I hated that yarn with such a passion that I contemplated just tossing it out, but the cheapskate in me couldn’t do that. Instead, I sent it too Goodwill but I still feel pangs of guilt for the person who thought they were getting a lovely yarn..
what a great scarf! It turned out beautiful, even with the yarn problems! Excellent job for any skill level crocheter! We’re glad you’ve finally come to the Dark Side. what a lovely colour. very pretty scarf. Beautiful! You’d never know this was your first crochet! Oh yes, that will be a perfect spring scarf. So pretty! The color is great, and I love the kinetic energy of the shape. Makes me want to pick up a hook, LOL! It’s stunning, congrats on a great [crocheted] FO! Nice work! I have yet to do an entire crochet project, but these girls are softening my resolve. Beautiful colour for that scarf. yay! what a beautiful scarf! i’m also really happy that i was helpful. welcome to the fun world of crochet. I find that it covers more ground more quickly than knitting and so, yes, it eats up more yarn. On the other hand, frogging is sooooooo much easier to do and much easier to put down and pick up, and don’t have to wait for the end of the row. Lovely scarf and yes, the color is essential. THat scarf is just beautiful. The color is perfect. I really love its undulating lines. Not quite enough to pick up a crochet hook, though! Crochet huh? Very nice scarf. I love the color and the triangles are visually appealing. I’m still scared of crochet, but you make it sound like it’s worth it in the end. Wonderful scarf! Welcome to the world of crochet. I’ve been both knitting and crocheting since I was 5 years old and I like both for their respective strengths and weaknessess. I love how well they play off each other. I can’t imagine knitting without knowing how to crochet and vice versa. I can’t wait to see what you make next. Ooh crochet, I really must learn how to do that. The colour reminds me of a spring sky. Perfect for this time of year. Well done for persisting with the plies! Perfect! You did it, Kathy, and it looks divine! I have found bamboo to be very splitty as well. You did a great job on this scarf. It’s so pretty! Especially in the drabness of winter. Happy New Year to you! What a perfect blue to brighten the dreary winter day! That is great work for being fairly new at crocheting. I’m making that exact scarf soon. I love your colors. and thanks for the heads up about the border. Always good to know. It came out beautifully! Love the colour!! 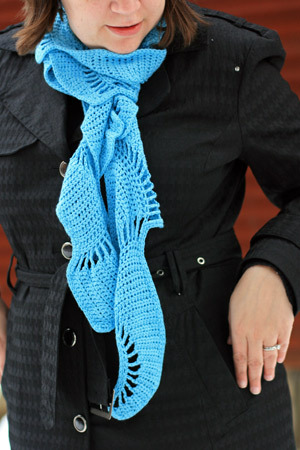 Looks great – who knows could this lead to my crochet conversion…. That came out very well! I love the color, but I’m very partial to blue so I am biased. Wow, I had this lined up in the cue(?) for use with sock yarn as the pattern calls for, but yours is rather a nice alternative. Great job, you muli- talented, mulit-crafter. how pretty! i love that blue.